Want to grow greens in a hurry? Flash Baby Leaf Mix Lettuce Mix is ready for harvest in just 25-30 days, and it grows back for another harvest in just one week. To harvest all season, just cut off the largest leaves at ground level. This mix of red and green crispy, textured and fast-growing varieties is easy to grow in containers, window boxes and the garden. It can be planted in both the spring and summer garden. 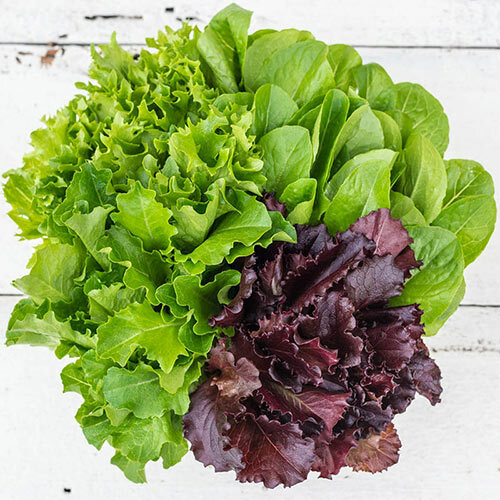 Lettuce grows best when grown in well-drained, cool, loose soil in full sun. 25-30 DAYS. Soil RequirementsPrefers well-drained, cool, loose soil. Keep well-watered. PruningHarvest all season by thinning out the largest leaves and cutting them off at ground level. CommentsFast growing. Great for containers and small spaces. Ideal for windowsills. Very vigorous. Great color. Great crunch. Days To Maturity25 - 30 days.